The 2 new unnu models are called 12S & 13S and are only 25,5 cm deep. 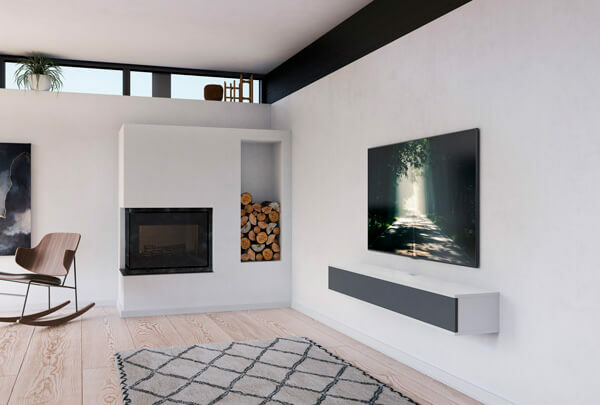 The idea behind the new unnu depth and the new models are simpel – even better sound closer to the wall. 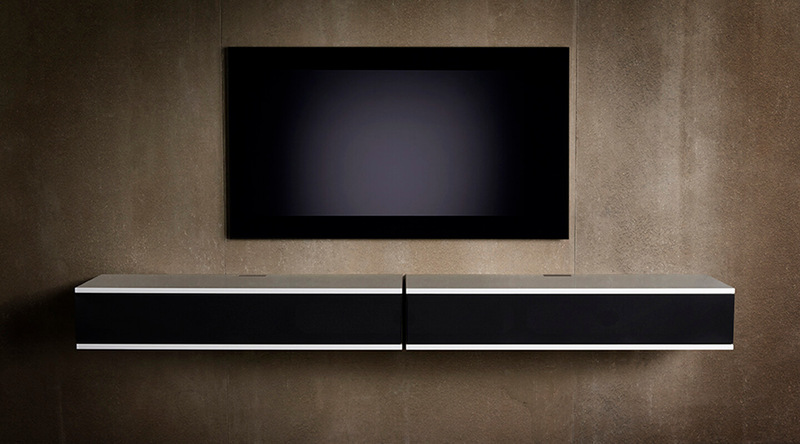 In spite of the small depth these new models can store many different setups from a Soundbar to a complete music system. You can see an example on how to place products inside model 13S here. The new models are available in white and black. Fabric doors in white, black, grey and silver. The new models can only be wall mounted. You can read more about the new models right here. sport events in your livingroom? We are introducing a new color fabric door in the unnu range. The new grey fabric door looks great in both the white and the black furniture. 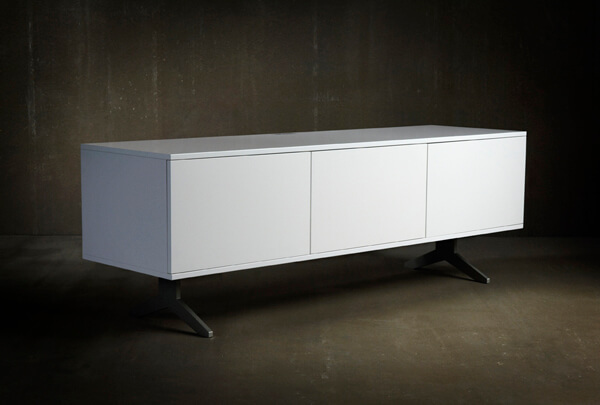 For the photo we chose 2 x model 120S in white – both with a grey fabric door. The new door can be ordered now and is available for all unnu models. 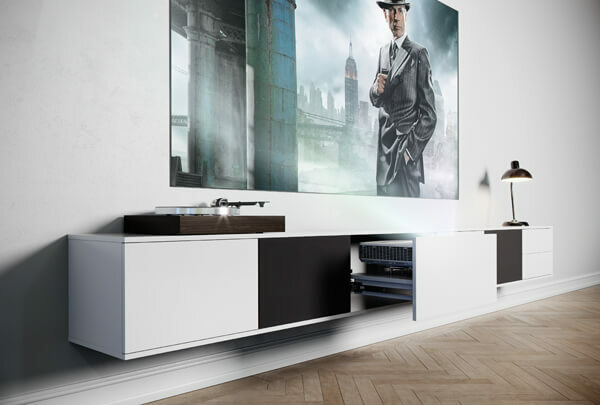 If you are looking for a cool setup for your favourite vinyls in your livingroom then we have the solution for you. 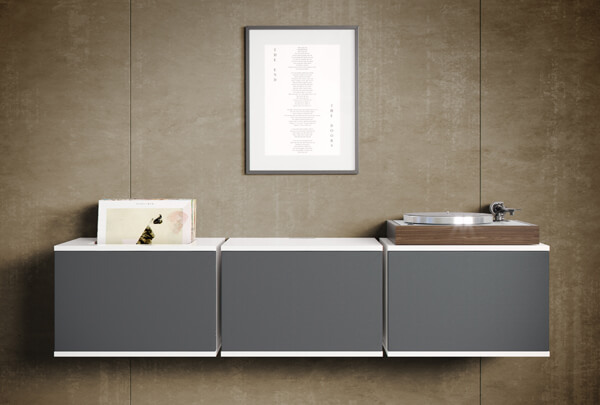 With the new models – 210LP and 211LP, you can store your favourite vinyls in the top of the furniture. We have placed the new model alongside 2 ‘regular’ model 210 and placed our Turntable on the top. Speakers and other equipment are hidden behind the fabric doors. And yes, it is a brand new grey colour on the fabric doors that will be available in September – just like the new LP models. 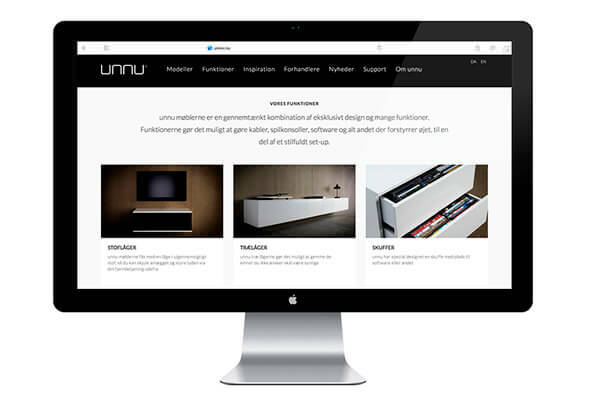 With the new website we also introduce a long line of news in the unnu range. New models, new accessories and a new inspiration page. unnu version 2 is an upgraded version of the existing unnu. The design is the same, but the quality is much higher and better. 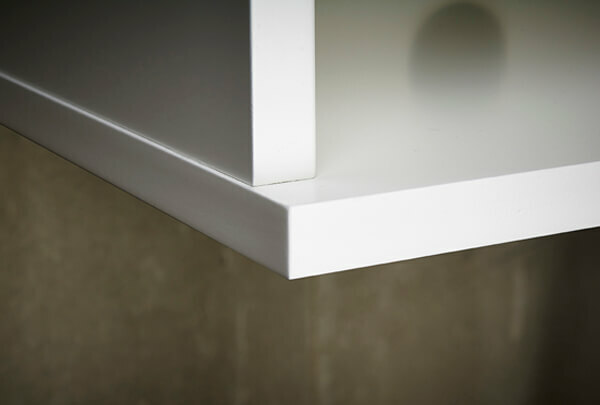 unnu is now produced in MDF and the paint is a polyurethane paint. This type of paint is both hardwearing and colorfast. All the new upgrades leaves the unnu furniture sharp in the finish. All unnu furniture, wood doors and drawers are in the new quality. On the photo above is 2 of the new model 120S. All unnu models can be placed on the special designed unnu stands. One set of unnu stands consists of 4, 5 or 6 stands machined out of one piece of aluminum. All unnu stands have adjustable feet to ensure the correct hight. Read more – go to Functions / Stands. 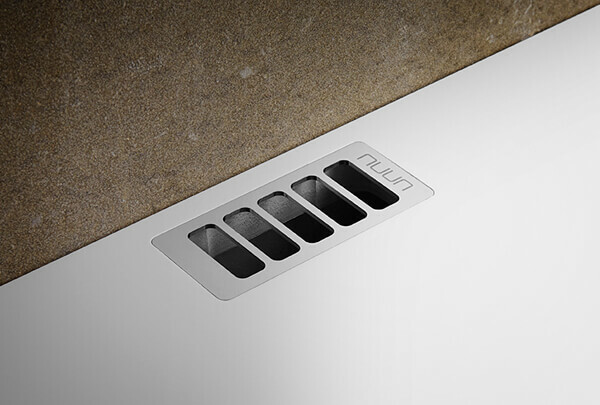 If you have products inside your unnu furniture that get really warm, you can use our ventilation solution. With a unnu ventilation you can cool down the items you have placed in your unnu furniture, usually behind a wood or a fabric door. The ventilation is mounted under the cable hole in the top of the furniture. The ventilation fits in most unnu models. 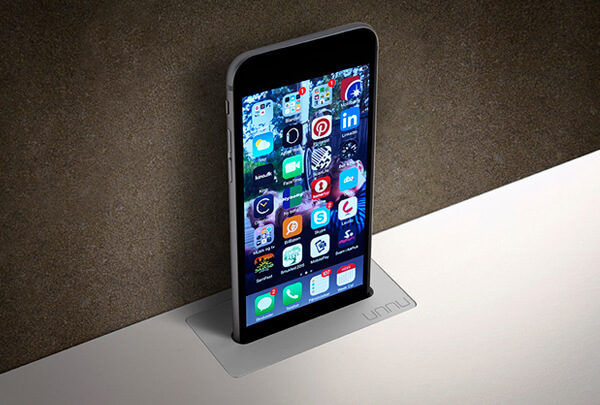 The unnu base is ideal for an elegant solution on the floor. We are introducing two new sizes to add to the options. Read more – go to Functions / Base. 130S is a brand new model in a brand new depth, 36,5 cm. In model 130S we have pulled the middle bars in the furniture back. 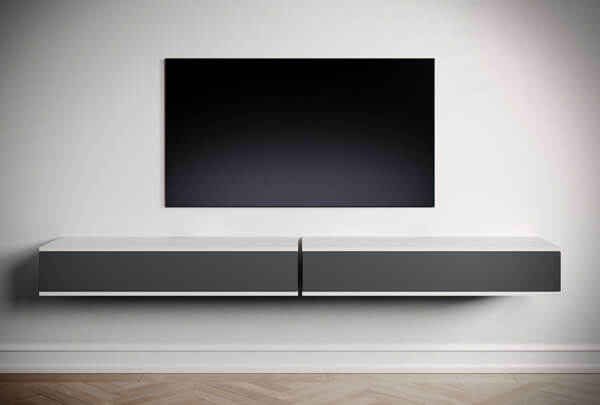 This gives us with the possibility to store a soundbar in the furniture and still have space for other items. 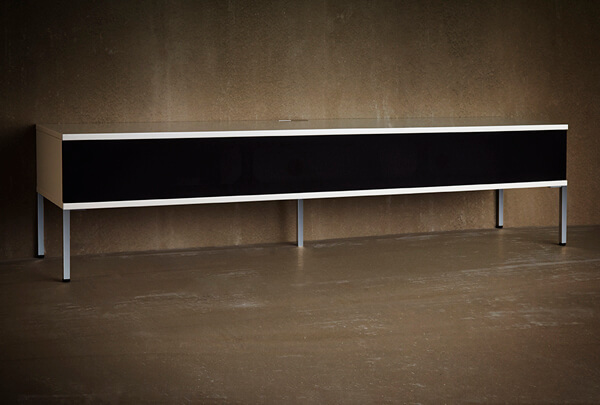 It is also possible to place a Hifi system in the middle and speakers on each side. This model has one big door that opens downwards. The new model can be delivered in black and white and black paint just like the other unnu models. Read more about the new model under MODELS in the top menu.